The above slab is a carbonate hardground from the Liberty Formation (Upper Ordovician) of southern Ohio. Carbonate hardgrounds are cemented seafloors, so we’re actually looking at the hard rocky bottom of an Ordovician sea. I’ve long found the idea of a hardground fascinating — it is like a bit of ancient time frozen before us. This hardground is especially interesting because of the fossils associated with it. The knobby nature of the surface is probably due to a burrow system that was preferentially cemented and then exhumed by currents that washed away the loose sediment. The intersecting tunnels, now ridges, provided numerous crannies for encrusting, boring and nestling organisms to inhabit. 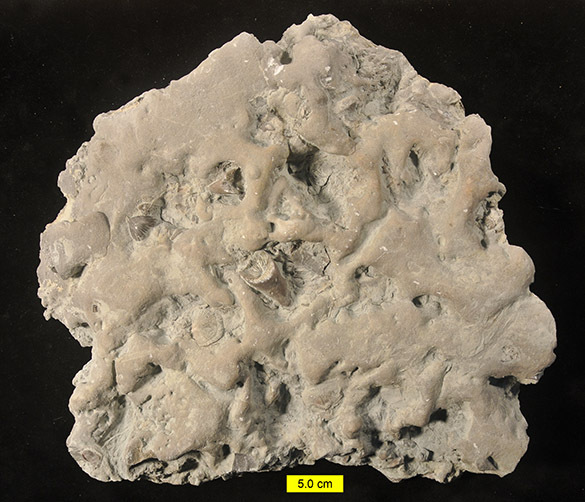 The high points hosted encrusting bryozoans that needed currents for their filter-feeding. 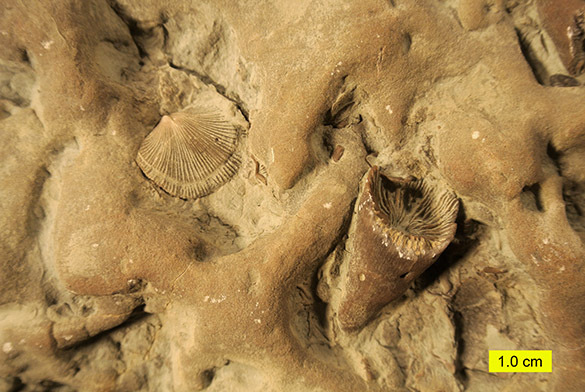 Here is another detailed view of the hardground showing a second rugose coral on the left. 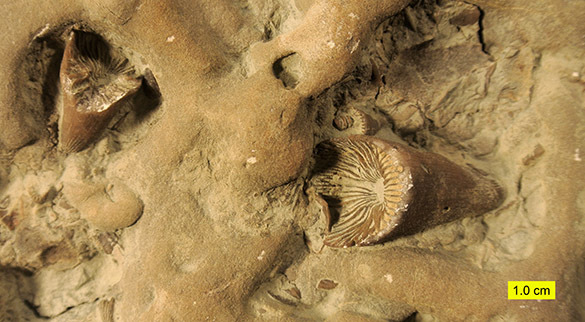 I suspect that the corals and maybe even the brachiopod are actually in place (or “in situ” to use the fancy words). I’ve seen such occurrences before and passed them off as just examples of loose fossils rolling into holes. Here, though, we can see that both corals have the calyx (the cup in which the coral polyp was located) facing upwards. These G. canadensis corals did not attach to hard substrates like some of their cousins, but lay recumbent and curved upwards on the seafloor. What better place to do so than in the cozy hollows of a hardground? This slab is certainly a nice vignette of a marine community nearly 450 million years old. Hall, J. 1847. Paleontology of New York, v. 1: Albany, State of New York, 338 p.